MOMMIES CARNIVAL is an event first of its kind happening in Chennai for Pregnant mothers (to be) and for Mothers & Kids. This event will give more insight on the things we know and unwrap the thoughts in regards to childbirth, Breastfeeding and newborn care. 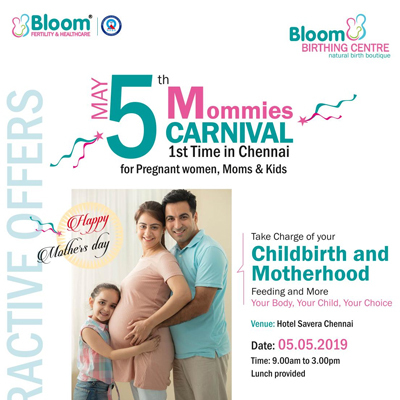 MOMMIES CARNIVAL is hosted by Bloom Birthing Centre, a unit of Bloom Health care. Bloom birthing centre is a Natural Birth Boutique, a unit of Bloom healthcare. It's a hospital attached Birthing Centre. It gives a home-like environment than the hospital labor ward, typically with more options during labor: food/drink, music, and the attendance of family and Spouse/Partner. "We also follow the Indian Obstetrics Norms when there is a deviation from the natural process"
Other characteristics of Birthing Centre are Birth pool or showers for Water Births which is large enough for both mother and father to be in the pool. The decor is meant to emphasize the normality of birth. In Bloom birthing center, women are free to act more spontaneously during their birth, such as performing comfortable postures that assist in labor. Active birth is encouraged. Bloom Birthing Centre provides Childbirth choices as entire Childbirth period are been personalized and individualized as couple's desire, within the limits of safety. Birth choices are been respected and supported by the Birth Centre staff. For example, any birth position that is comfortable for the mother is acceptable. Informative Session is to give knowledge on the things we think it to be right needs more information for this generation needs. Cloth Pad Revolution! It's a comeback for cloth pads! The concept of sanitary pad has been prevalent as early as the 10th century. The earliest disposable pads were made of cotton/ wool which were covered with an absorbent liner, later found to be unsuccessful. Before this revolution, most of the women around the world used a lot of unsafe methods to control their menstrual blood. They used paper, moss, sand; grass etc. which is then folded inside a cloth and used as sanitary pads, which on a long run caused a lot of harm to the human body.